We are a leading Manufacturer of flp plunger pump, double diaphragm dosing pump, diaphragm electrical pump, diaphragm pump, air operated double diaphragm pump and ptfe acid injection pump from Chennai, India. We are actively engaged in offering a wide gamut of Double Diaphragm Dosing Pump. 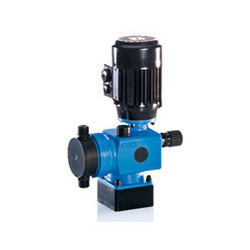 The offered pumps are designed using high grade raw materials and latest technology with set universal standards. Additionally, the offered pumps are checked against various parameters of quality under the strict supervision of quality controllers to ensure the flawless deliveries. In addition to this, offered pumps can also be customized as per various specifications from our prestigious clients. We export supreme quality Diaphragm Electrical Pump which is used in various industries with flow rate as good as 65 litres per minutes, these specially built pumps are highly efficient. Their heavy weight design doesn’t bother the user since they come with trolley structure. With low maintenance, these pumps are fast and superb in performance. It consumes less time and power. It comprises of a smooth surface and is used in various processing industries. We are Leading Manufacturer, Supplier, Dealer & Exporter of Diaphragm Pump (PTFE) for the customers. These are PTFE / PFA / FEP / ECTFE / ETFE Lined Diaphragm Pumps. These PTFE Diaphragm Pumps are sturdily designed by using high grade material. Further, the flexible design and world class quality of these PTFE Diaphragm Pumps are the result of the innovative ideas of our professionals. We being a commended name of the industry are affianced in bringing forth for our valuable clients a superior quality array of Air Operated Double Diaphragm Pump. These offered products are developed beneath the direction of skilled personnel using of supreme-grade inputs as per the set industrial norms and guidelines. Besides this, we offer these products after testing their quality to maintain flawlessness. Rugged Bolted Construction: Is superior to any other as it eliminates possibilities of leakage, misalignment during assembly etc. Handles a wide variety of fluids with high solids content: No close fitting or rotating parts so liquid with high solid content and/or size can be easily pumped. Self Priming: The pump design (incorporating internal check valves) allows for high suction lift even at dry start-up and with heavier fluids. Ability to run dry: No close fittings or sliding parts are at risk. The pump can run dry without damage. Variable flow rate and discharge pressure: Pumps will run at any setting within their operating range simply by adjusting the air inlet pressure and system conditions. One pump can fit a broad spectrum of applications. Portable/Simple Installation: Pumps transport easily to the application site. Simply connect your air supply line and liquid lines; the pump is ready to perform. There are no complex controls to install and operate. Dead Head: Because the discharge pressure can never exceed air inlet pressure, the discharge line can be closed with no damage or wear. The pump will simply slow down and stop. Shear sensitive: The gentle nature and minimal parts contact with the liquid makes these pumps an excellent choice for shear sensitive fluids. Explosion Proof: As pumps are operated by compressed air, therefore, they are intrinsically safe. PTFE Acid Injection Pump. offered comprise high performance based PTFE molded pumps for use in loading and unloading of corrosive liquids. Finding usage suitability in industry sectors like chemicals, fertilizers, petrochemicals, fertilizer plants, for highly corrosive acid transfer, caustic , plants, scrubber units, organic/non organic chemicals, effluent transfer and others, we make it available in different working capacity, head, speed, pump size-dn and working temperature range. Also suitable to be used in high temperature applications, these offer outstanding performance and come in thick injection molded casing with C.I/S.S casing liner insert support. Diaphragm Pump offered come in a choice of aluminum, polypropylene, stainless steel as well as other metal options and find suitability in applications needing large volume transfer quickly. These are suitable for transferring contaminated media including cleaning pits/liquids which may contain mix of several products and can be made available in different working specifications so as to meet varied industrial requirements. Some of the industry sectors these find suitability in include Ceramics, Fluid handling, Paints, Pharma and others. Further, our expertise lies in making these available with different port size, discharge as well as flow rate options.